There could never be any song more appropriate for today than the 1966 classic “I Had Too Much To Dream Last Night” by The Electric Prunes. 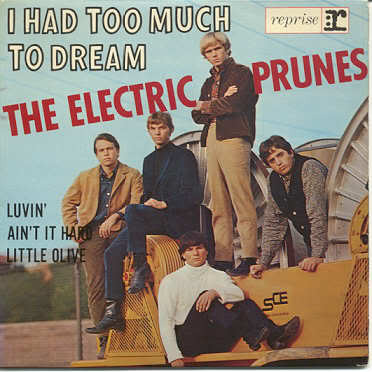 The Prunes were a West Coast psychedelic rock band who went through a humungous amount of line-up changes in their time together. One tidbit I love: Kenny Loggins was once part of their lineup. Not on this song, unfortunately. But back to my having too much to dream last night. You have no idea. Apparently tropical downpours, a couple of glasses of wine and some tense conversations do not bode well for the old r.e.m. One of the moments I can remember from a particularly upsetting part of my dream was that I was sitting with a (now ex-) friend (no doubt arguing) when this weird metal multi-line phone on the wall rang. My mother was on the other end, very upset. Bad use of pronouns, I know, but I’m quoting a dream. Grammatical errors are allowed in this instance. Anyway, I sensed that JFK was actually a dog in this dream, not the President. (As an aside, in awake life, I now love that name for a dog!) But it was weird. Strange. Sad. Upsetting. Starting tonight, I’m going on a major dream diet. Subscribe Here. it's like getting a postcard a day. The blog you should be reading.